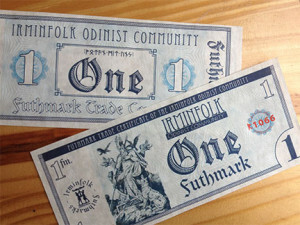 After a successful two-year trial run, The Irminfolk Odinist Community fully rolled out of its community currency program, the Futhmark. 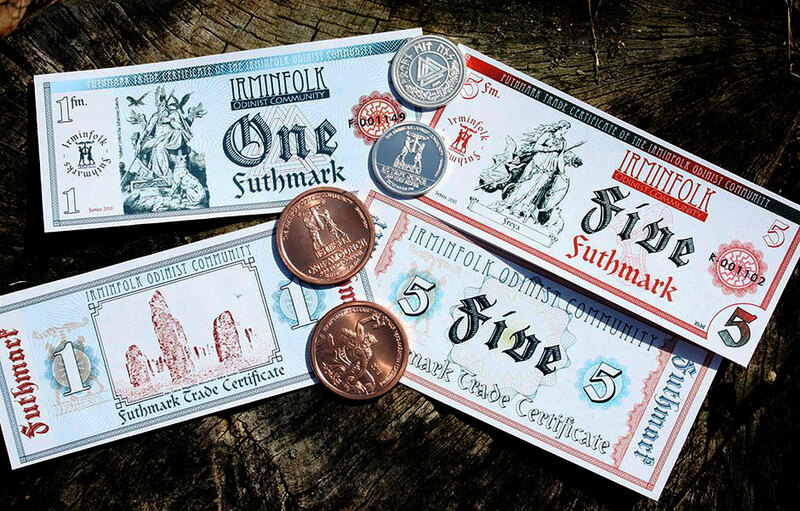 The Futhmark is a metal-based community currency project which aims to foster and promote a complimentary economy of wealth and value for Heathen Communities. The Mark was a unit of account in many nations. It is named for the mark unit of weight used to measure gold and silver. The word mark comes from a merging of three Teutonic/Germanic words and Latinized in the 9th Century. The Futhark is a script of alphabetic runes, used to write various Germanic languages from the second century AD to the eleventh century AD. The rune names are based on the sounds of the runes themselves but also have a basis in mythology, nature and the environment, daily life and the human condition. By combining the versatile wisdom of the Runes of the Elder Futhark with the traditional Germanic standards of the Mark, we created a currency system for modern Germanic Neopagans. The Futhmark standard, which sets the trade value of its Gold, Silver and Copper coins (and all fractional amounts thereof), is based on other formulas and standards in common use by other metal-based alternative currency programs. This ensures versatility and increases the possibilities of fair and even trade with other markets, such as those markets using the American Open Currency Standard (AOCS). One Futhmark is valued as either one fiftieth (1/50) of a Troy ounce of .999 Fine Silver for Silver Coins, one half (1/2) avoirdupois ounce .999 Copper, for Copper Coins, or one two-thousandth (1/2000) of a Troy ounce of .9999 Gold.Because alternative curencies are not protected by counterfeit laws, all Futhmarks must bear the Trademark of the Irminfolk Odinist Community, providing a solid legal foundation to protect the Futhmark from fraud. 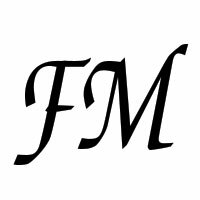 The currency symbol of the Futhmark is “FM” in Zapf Chancery typeface whenever practical. 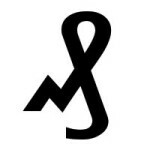 As a fractional sign the letter ‘d’ for ‘denarius’ in German kurrent script is used: ₰ The symbol is encoded in Unicode at U+20B0 ₰ german penny sign (HTML: ₰). It represents 1⁄100 of a Futhmark the same way 1¢ is 1⁄100 of a dollar. 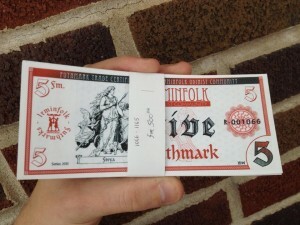 Futhmarks work as a complimentary currency to official legal tender (U.S. 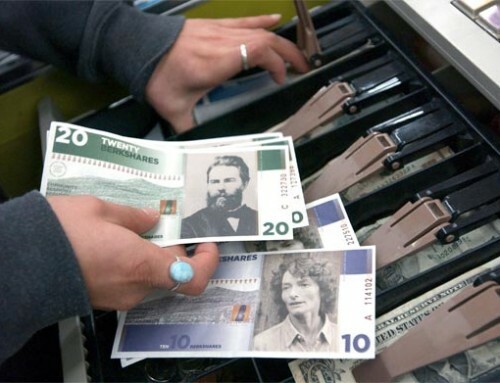 Dollars) with a voluntary exchange rate of 1:1 among participating vendors. This exchange rate system allows for eventual (inevitable?) adjustment of the relationship of the Futhmark vs. the Dollar without having to re-strike all our coins with new denominations. 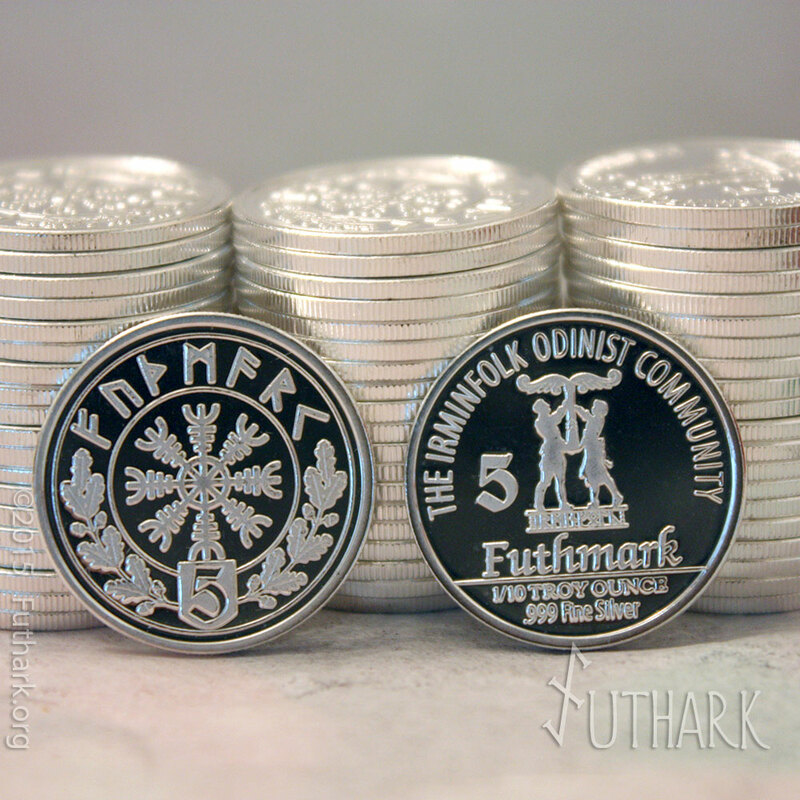 One Futhmark will always be 1/50 an ounce of Silver, and we currently exchange them one-to-one with dollars. In the future, if the purchasing value of the dollar declines, a new exchange rate will be published reflecting the relationship of Futhmarks to Dollars. The exchange rate of other world currencies to Futhmarks are pinned to their relationship to the US dollar. The Futhmark program will have a broad range of commonly used denominations to facilitate transactions in as wide a range of exchanges as can be anticipated. Currently, there are ₰13,000.00 in circulation. The 25 FM Coin. One Half Troy Ounce of .999 Fine Silver (500 of the 2014 series minted as of May) The 2014 Wotan Mit Uns series is slated to return in 2016 with all new dies sculpted from a master plaster sculpt. They will also have a face value whereas the current 2014 series have no denomination on them. The 5FM Coin. One Tenth Troy Ounce of .999 Fine Silver (minted Midsummer 2015) The 5FM coin is minted on 1/10 of an ounce of .999 fine silver and is the first Futhmark Coin to bear a denomination. 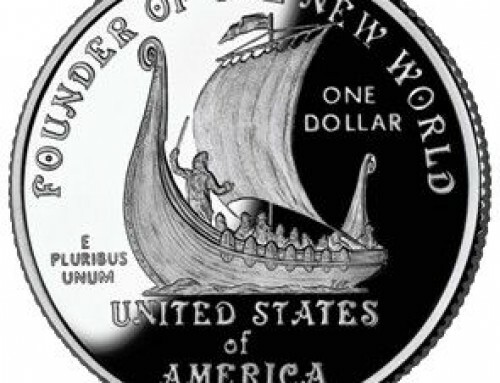 The Reverse features the Crest of the irminfolk, and the Obverse features the Helm of Awe. The 2FM Coin. One Av. 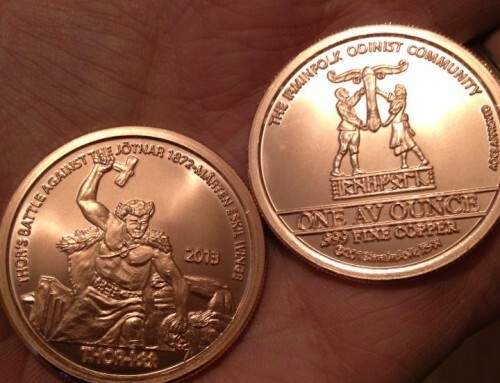 Ounce of .999 Fine Copper (3,000 ounces of the 2013 series minted) The coin that started it all, the 2013 Thor Copper ounce! 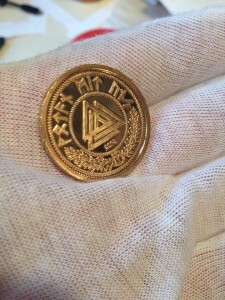 The 1FM coin. One Half AV. Ounce of .999 Fine Copper (Still under review whether coins or notes are more practical) Replaced with Polymer notes with a reserve of metal ₰ coins segregated to back the notes. The 5FM paper note, printed on bonded polymer paper and featuring the image of Freya. The 1FM paper note, Printed on Bonded polymer paper and featuring the Image of Odin. The Futhmark (FM) is subdivided into 100 FuthPfennig (Fpf). (The word “Pfennig” seems to rely on the way coins were minted during the Middle Ages: the base material were thin flat metal discs. 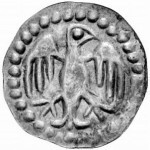 The value was embossed from one side, creating a pan “Pfanne” like coin). For denominations which are so low that a struck medal coin would be infinitesimally small, or cost more to make than they will ever be worth (for example: .25₰, .10₰, .05₰ and .01₰) there will be paper warehouse receipts issued against a certified amount of actual stored Futhmarks. 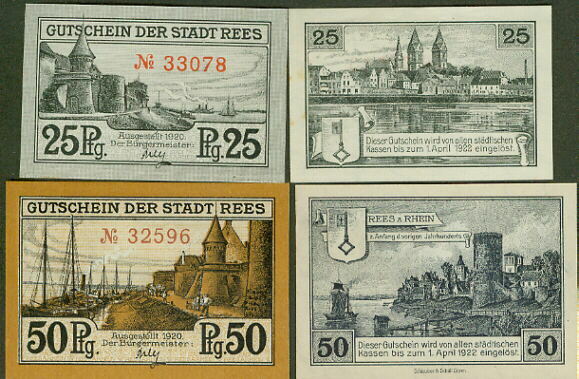 Small denomination “change” was commonly printed on paper, like these 25 and 50 pfennig banknotes from Wiemar Germany. It makes more sense to print the “change” as paper and the higher denominations be coins, than the other way around. A US quarter has more intrinsic value than a US $100 bill. Community Empowerment/ The Multiplier Effect. 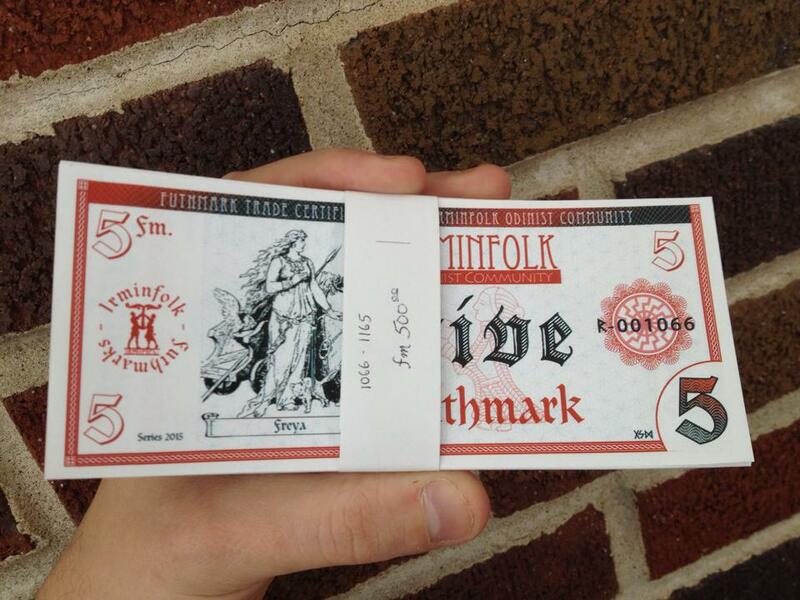 Each time you use a Futhmark, you are helping to increase the local community/ kindred / tribe’s circulation of goods and services. When a customer spends a Futhmark with a merchant, it moves from hand-to-hand allows for someone else to spend that Futhmark again somewhere else, distributing Futhmarks as a means of exchange. In a resilient local economy, that Futhmark could be spent many times locally, maintaining and growing the wealth in that community. In the greater national economy, most of our dollars flow out and away from our communities as soon as they are used, enriching national and multinational companies far away from where the money is spent. But a community currency is inherently limited to a particular place or group, so it incentives people to shop at locally-owned businesses and keeps wealth flowing within the community. This is called the multiplier effect. The Futhmark denomination formula provides a consistent value to commodities used as a means of exchange; specifically Gold, silver, and Copper. However, any time you tie a currency with a commodity, you run the risk of your commodity value exceeding that of your currency. When the commodity value exceeds the face value of your currency, the currency is rendered “useless”. (See Gresham’s law) After all, no one would spend a five-dollar silver piece when the silver it is made from is “worth” six. The reason we call money “currency” is because of its need to flow, like water current, through a community in order to remain solvent. Water always flows toward the path of least resistance, distributing itself downward. The Futhmark must therefore have an intrinsic value lower than its face value in order to provide the “gravity” that keeps the “current” flowing. An example of this can be seen in the Silver Dimes and Quarters being removed from circulation in the 1960s, and the removal of copper from pennies in the early 1980s. The commodity value of these coins far exceeds the “current” value of them today, and so they no longer circulate; they are hoparded and melted down for their metal. They are useless as money if it is not worthwhile to spend them. The Futhmark Face Value also allows for seamless financial recordkeeping for a business owner who accepts Federal Reserve Notes and Futhmarks as payment for goods and services. 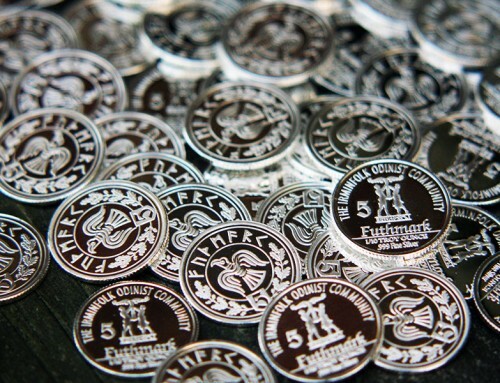 When a merchant accepts a 50FM silver coin as payment, he is providing the customer with $50.00 worth of product in today’s pricing. Recordkeeping is accomplished in exactly the same manner that Gift Certificate transactions are recorded. The Futhmark Face value makes the transaction convenient for the buyer and seller. Bartering commodities like copper and junk silver by researching the current spot price, and multiplying it by the alloy content to find a calculated value at that moment is impractical to most businesses. It is time-consuming, and prone to mistakes and dishonesty. The Futhmark face value brings stability to the currency by allowing people to accurately predict their expenditures and create budgets. If in one week spot silver prices are high, then it would be a good opportunity to purchase things with scrap silver, but if there is a substantial drop in the spot price, then he will have to exchange substantially more silver for the exact same purchases. If that person were receiving a specific amount of silver each week, as pay, he would have no way to predict how much purchasing power he would have from one moment to the next. A face value levels the playing field. The Futhmark face Value is consistent with the formulas of many other Alternative Currency markets which provides an overall stabilizing effect on the concept of metal based alternative currencies, as well as allowing for even and seamless exchange with other local economies. This helps in minimizing the risk of economic isolation. Each Futhmark carries with it ensured quality. Futhmarks must be made of investment grade metals in the weight and purity specified while also bearing visually appealing symbols of Germanic Heathenry. Delivering on this commitment required us to work with only the most reputable and experienced minting and engraving facilities, and to contract with some of the best sculptors and concept artists in the industry. The Futhmark promotes the essence of Germanic Neopaganism explicitly, and implicitly. 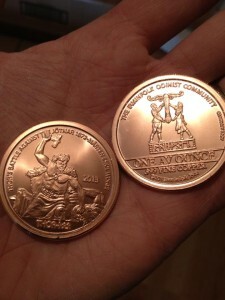 As a local community currency, it embodies the virtue of self-reliance. They are a talisman of the faith of our ancestors, struck with symbols and motifs of our faith in the Aesir and the Vanir. 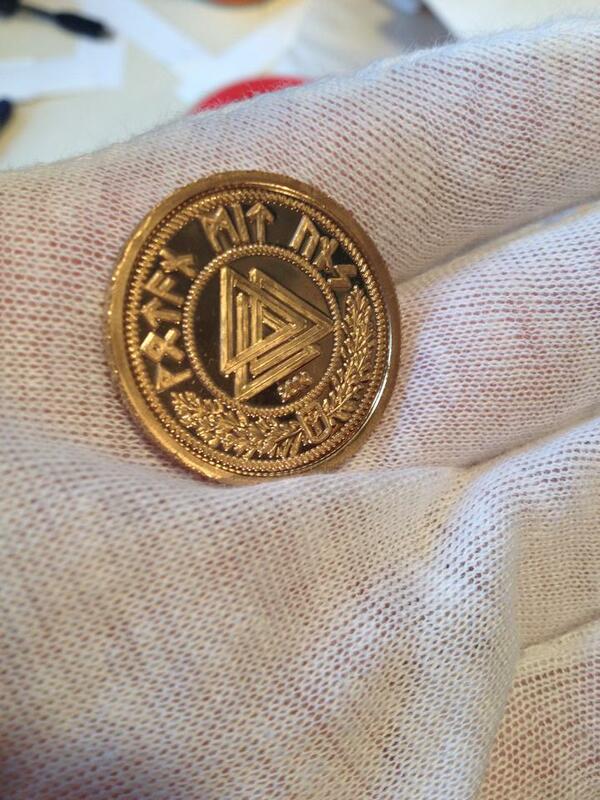 And the Futhmark is from the Earth; made of Pure Copper, Pure Silver, And Pure Gold. 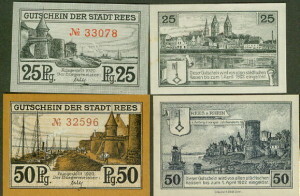 Low minting numbers ensure the collectivity of the various Futhmark designs. 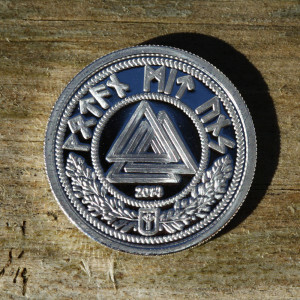 Each new Futhmark design is minted in very small numbers compared to typical coin or commemorative medallion strikings. Only a few thousands of each new design are struck, and they tend to disappear into circulation (or collections) very quickly. With this ambitious program, we hope to set new standards for Heathen community building that others may follow. We hope that this program will provide enough value and prosperity that it fuels other, even more ambitious projects later on. 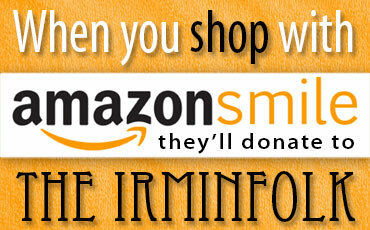 We hope you will join us in nurturing this program. “The course our city runs is the same towards men and money. She has true and worthy sons. She has fine new gold and ancient silver, Coins untouched with alloys, gold or silver, Each well minted, tested each and ringing clear. Yet we never use them! Others pass from hand to hand, Sorry brass just struck last week and branded with a wretched brand. So with men we know for upright,blameless lives and noble names. These we spurn for men of brass…” -Aristophanes, The Frogs, – 405 B.C. 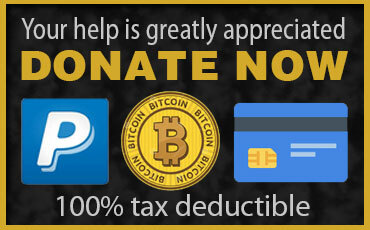 Irminfolk Coins – A giant leap forward in Odinist Community Building. New England town issues its own “dollar alternative” currency.